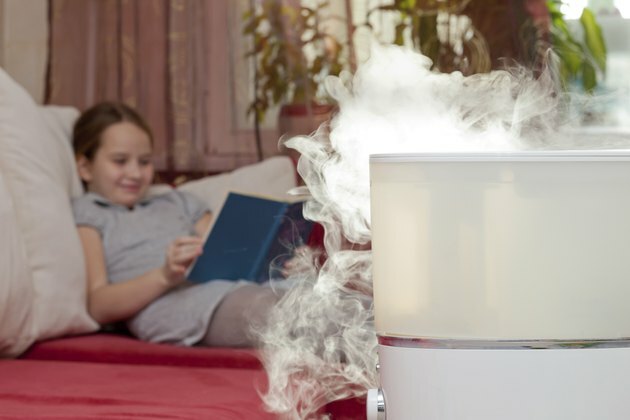 A cool mist humidifier can benefit you and your home during cold weather months. The additional moisture cool mist humidifiers add to winter air can relieve your dry skin, nose and throat -- as well as reduce static electricity and prevent wooden furniture from drying and cracking. In order to realize these benefits without putting your family at risk, however, there are procedures to follow and precautions to ensure your cool mist humidifier operates safely and effectively. Correct placement will help your cool mist humidifier run efficiently. An appropriate location is a flat, level and firm surface a minimum of five inches away from walls or any heat source. In addition, make sure you do not place objects close to or on top of the humidifier that could block air openings. Check the area around the humidifier regularly to make sure absorbent materials such as carpeting, curtains or tablecloths do not become wet. An additional consideration regarding placement involves your child. If you choose to place a cool mist humidifier in your child's bedroom, ensure your child's safety and health by paying close attention to correct placement recommendations and keep the unit scrupulously clean. Use a hygrometer, also called a humidistat, or choose a cool mist humidifier with a built-in hygrometer to make sure the humidity level in your home stays between 30 and 50 percent. Humidity levels above 50 percent not only cause condensation to form on windows, walls and floors, but also triggers the growth of allergens such as bacteria, dust mites and molds. If humidity levels become too high, turn the unit down or off until levels return to an acceptable range. In contrast to a warm mist humidifier that boils water before dispersing, water in a cool mist humidifier is subject to growing bacteria and molds that can make you sick. Because of this, cleanliness is essential when running a cool mist humidifier, especially if you choose an ultrasonic or impeller cool mist humidifier. Both of these cool mist humidifier types have powerful delivery systems that can disperse large amounts of pollutants, such as microorganisms and minerals into the air. A third type, an evaporative cool mist humidifier uses a less powerful delivery system that results in fewer pollutants dispersed into the air. No matter which type you choose, empty, dry and refill the tank with clean, distilled water each day, as well as giving the humidifier a thorough cleaning every three days with three percent hydrogen peroxide -- a commercial antiseptic solution made of 97 percent water and three percent hydrogen peroxide, available for purchase at your local pharmacy or department store. In addition to everyday cleaning, follow the maintenance schedule your manufacturer recommends. Inspect removable parts such as filters—clean these parts or replace them. Before storing your humidifier for an extended time, empty the water tank and then clean, disinfect and dry thoroughly before storing in a cool, dry location.